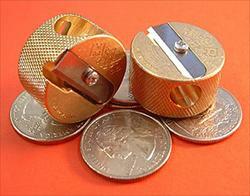 The photo to the right is enlarged for detail; the coins will help give a sense of the true size of the sharpener. The price listed is for one sharpener only. This sharpener features two different sized openings and will take different sized pencils; or give two different sized tips to standard sized pencils (a short tip or a longer, sharper tip). A very solid, heavy little sharpener!